God is good. It’s a simple yet profound statement. Do you believe it? I mean, do you really believe it? More than just having an intellectual knowledge of God’s goodness, do you believe it in your heart to the point of your entire life being influenced by this one declaration? Your belief or lack of belief in the goodness of God will impact every aspect of your life. There seems to be a great deal of emphasis on suffering for our faith and for the sake of the gospel. In fact, much of what my family has been going through and a lot of my recent writing centers around the cost of stepping out in faith and pursuing God. Although this is a necessary and somewhat unavoidable part of life, it’s not all there is and it certainly isn’t God’s primary purpose for our lives. We have a good Father. He has good things for us and desires to bless us, just like a good earthly parent would. Trudging through the difficult circumstances and enduring hard times bring us into God’s true purposes for our lives. Just as the Israelites wandering in the wilderness for 40 years before entering the Promised Land wasn’t God’s ultimate purpose for them, suffering and hardship is not God’s ultimate purpose for us. 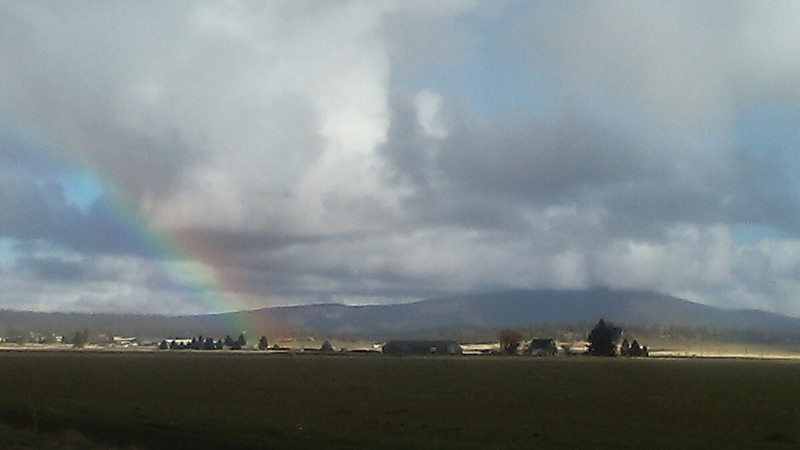 The rainbow we saw on our way to Bend, Oregon after a very emotionally exhausting week–a reminder that God is good. We also see God in our hardships and struggles. We feel Him comfort us as we grieve. He gives us guidance when we are lost and despairing. He gives us hope when we are hopeless. And in all of this, He’s creating a heart within us that’s more loving and more responsive to His love. A couple months ago, when I realized the holiday season was upon us, I went through a two-week grieving period. I grieved over how different my Thanksgiving and Christmas season would be. Instead of lovely snow, I would experience heavy rainfall. Instead of baking cookies with my mom, I would attempt to make baked goods in my miniature kitchen. Instead of sitting by the warm fireplace, I could huddle over the heater vent on our trailer floor. Instead of spending the holidays with my family, I would be… well, I didn’t know where I’d be! I had to grieve all the feel-good things about Christmas I had grown accustomed to—the cozy feeling of being warm inside on a snowy day, the Christmas decorations and lovely aromas filling the house, and the days spent hanging out at my family’s house while the kids played. I wouldn’t have any of that. This grieving that I went through was a necessary “letting go”. Without this process of releasing my expectations, I wouldn’t have any room for what God was preparing for us. After talking to my new friend here in Redding about how hard it is anticipating a Christmas in our trailer, she encouraged me with a word from God. She let me know how God was going to bless us this Christmas season with surprises and that we should expect great things. I excitedly received that! Thanksgiving week was actually pretty amazing. After a rather emotionally exhausting week previously, we spontaneously decided to drive north to Bend, Oregon, where Josh is from (and we are never spontaneous). 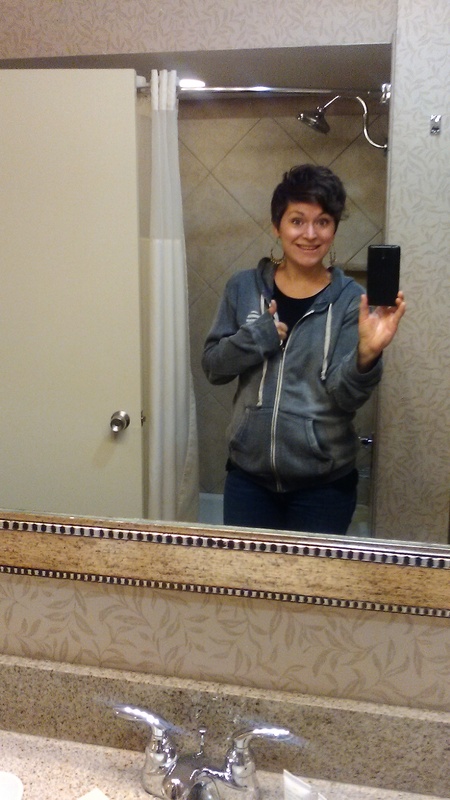 I found a great deal on a nice hotel with a large fireplace in the lobby, continental breakfast, and a nice room with a full-sized bathroom. Full-size bathroom with a tub! What! After cozying in front of the fireplace with my son, I took a nice, long bath for the first time in six months! Living in a trailer definitely causes you to be thankful for all the little amenities we usually take for granted. 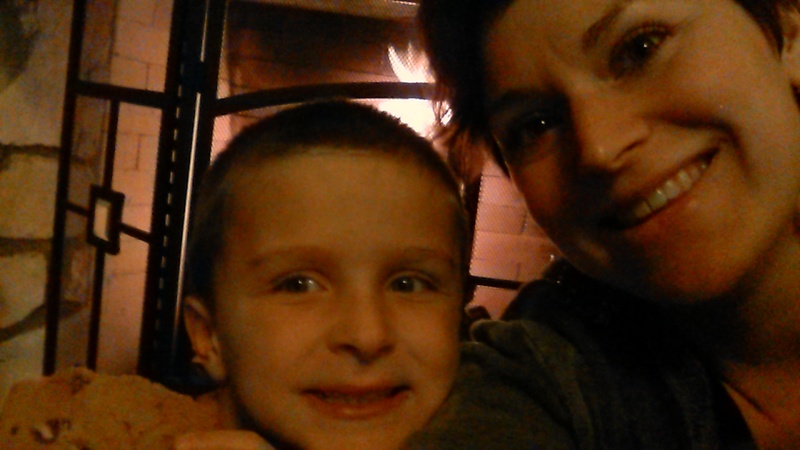 Relaxing in front of the hotel fireplace with my son. Bend was a special couple of days as we were able to rest and relax as a family. We even met up with my high school art teacher and her husband (they moved from Anchorage to Bend 15 years ago) and some family friends of Josh’s. When we got back to Redding, we spent Thanksgiving with some wonderful new friends who invited many Redding newcomers to their home for a potluck-style feast. Although I was away from my family, Thanksgiving ended up being a super blessed and fun time for us. About a week after my friend had encouraged me with her word from God regarding Christmas, my sister calls me out of the blue to let me know that her Southern California home will be empty during Christmas if we wanted to stay there. What a gift from God! We celebrated our Christmas a week early and headed down to Temecula for a week of fun and family time. What a special time it was too! Not only did we have a big, nice house to stay in, but we experienced so many blessings and surprises on top of that. 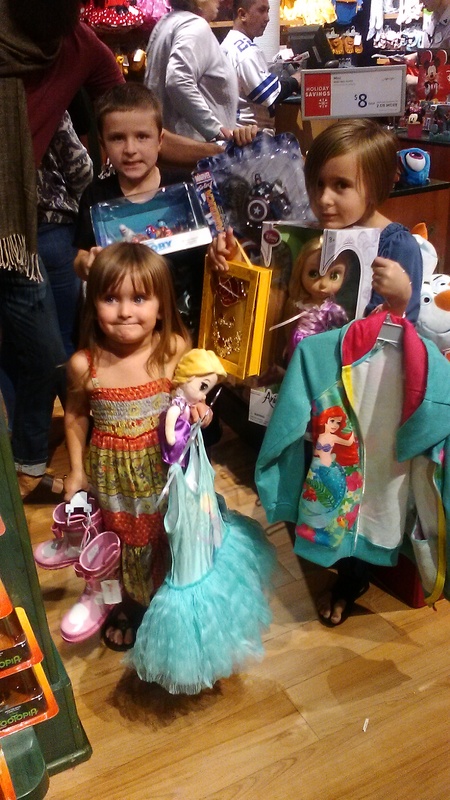 Because of a monetary gift from my parents, we were able to surprise the kids with a Disney Store shopping spree. Josh’s mom also sent money, which allowed us to splurge at a children’s museum (where I also met up with a good friend) and dining out. Using Grandma and Grandpa’s Christmas money on a Disney Store shopping spree! Score! The biggest blessing was being able to go to Josh’s aunt and uncle’s house for Christmas dinner. Not only did we enjoy great company and delicious food, but they unexpectedly spoiled our whole family with generous gifts. Josh’s family made us feel so welcomed and loved. They are truly a godly example of love and generosity. Although it seems like I’m emphasizing all the gifts we received, it’s really not about the gifts at all. It’s about the heart behind the giving. It’s about receiving with gratitude the generous blessings of our good Father. And when we truly receive with a thankful heart knowing we don’t deserve it, the blessing doesn’t ruin us like an entitled child. Instead, we feel more loved, which causes us to draw closer to a loving God we can trust. It’s so important that, as God’s children, we believe that He is good and desires good for us. Even in our hard times, we know that He’s working all things for the good of those who love Him (Romans 8:28). But just as the Israelites were tempted to return to a life of slavery in Egypt when they lost their vision of the land God had promised them, we too can be tempted to quit and return to what’s comfortable when we lose sight of God’s ultimate purpose for our lives. God has plans to “prosper you and not to harm you, plans to give you a hope and a future” (Jeremiah 29:11). Jesus came that you “may have life, and have it to the full” (John 10:10). His purposes are always good and He is trustworthy. If this is hard to believe, we will always struggle to step out in faith and obedience because deep down we don’t trust the goodness of God. But if we live in the awareness that God is good, we will risk everything to pursue Him and His purposes for us. I appreciate your feedback! Do you find it difficult to believe in the goodness of God? How has your awareness or lack of awareness affected your walk with God? Comment below! For more on the goodness of God, read “God is Good” by Bill Johnson. Previous Previous post: Can Comparison be a Good Thing? Next Next post: Faith is Like… Kayaking? Tears! This makes me so happy and is encouraging to my heart! Can’t wait to hear more about all those good things!